The New York journal VVV (1942–1944) manifests a desire for tangibility that was a major component of surrealist practice in exile during World War II. VVV’s design and contents at once reflect the forced relocation of the avant-garde across the Atlantic and the surrealists’ willingness to prolong their movement through portable projects accessible to those outside their vulnerable contingency. Due to wartime censorship and the uncertainties of geopolitical displacement, American David Hare was named as the publication’s editor while André Breton, Max Ernst, and Marcel Duchamp served as an advisory committee. Like the installations on view in New York during the First Papers of Surrealism exhibition (1942) and at Peggy Guggenheim’s Art of This Century gallery (1942–1947), the journal’s design encourages audience interaction. However, unlike its eclectic Parisian precursor Minotaure (1933–1939) or contemporary wartime journals View (1940–1947) and Dyn (1942–1944), VVV ultimately transcends the rarified space of the gallery through affinities with avant-garde film. A direct comparison between a selection of the maneuverable components in VVV and Maya Deren’s infatuation with the tangible parameters of Guggenheim’s gallery in her film project Witch’s Cradle (1943) conveys precisely how the journal reaches out to its readers. The inaugural issue of VVV credits the American artist David Hare as the journal’s editor. Hare’s name led VVV’s masthead ahead of his potentially controversial editorial advisers: André Breton, Max Ernst, and, after the first issue, Marcel Duchamp, who, in truth, did more to steer the genesis of the publication in New York in June 1942. These European exiles were limited in their means of preserving some semblance of their avant-gardism across the Atlantic and amidst wartime protocols. During the journal’s sporadic run, which ended with a fourth and final number in February 1944, Hare’s United States citizenship was used to deflect suspicions that could have thwarted VVV’s very existence. The fact that such notorious surrealist egos were willing to cede top billing to a relatively unknown and unvetted name speaks to the constraints of censorship and shortages. The frequency with which such maneuverable content appears in VVV is not anomalous but instead extends from a tendency that art historian Adam Jolles has identified as “the tactile turn” in surrealist exhibition practice. Jolles describes the tactile turn as a means of “preventing [works of art] from ever reaching a state of decisive completion or permanent closure” (141). As we shall see, the pages of VVV adamantly refuse closure in ways that prove that the ephemeral publication was a space of experimentation as well as communication and documentation. The journal’s debut in 1942 did not just happen to prefigure the First Papers of Surrealism (First Papers) exhibition and Peggy Guggenheim’s opening of her Art of This Century gallery—two New York events that display the propensity toward the tactile that Jolles describes. New York art collectors Bernard and Rebecca Reis indeed financed VVV’s handheld form and pliable contents (Dimakopoulou 749). The journal accordingly represents an under-examined manifestation of the same ideas that shaped landmark surrealist installations. If the same rather instinctive grasping for their familiars prompted the coalescence of the groups of exiled collaborators who published VVV and staged First Papers, the Art of This Century gallery motivated much of the experimental architectural design that the journal’s creators would more pointedly adapt for the printed page. Guggenheim curated and renovated Art of This Century with designer Frederick Kiesler to serve as a more permanent showcase for her art collection. Unlike First Papers, the space did not merely create a Manhattan iteration of the Parisian Exposition Internationale du Surréalisme, in which Duchamp’s 1938 coal-bag cave foreshadowed his 16 Miles of String. For Kiesler’s distinctive arrangements—from the Abstract Gallery’s suspended pedestals to the Surrealist Gallery’s curved wooden walls and light modulation—were designed to enhance rather than upstage the objects from Guggenheim’s collection installed in Art of This Century. As will become clear through examples below, just as Maya Deren attempted a likeminded film project entitled Witch’s Cradle in 1943, the VVV group attempted to replicate in print Guggenheim’s melding of artworks with their context. Like the Art of This Century gallery’s immersive environment, the journal’s design encourages participation throughout both cognitively, as readers must contend with a variety of prose, poetry, and imagery from a wide range of geographical and temporal areas, and physically, as the orientation of illustrations and texts changes frequently. 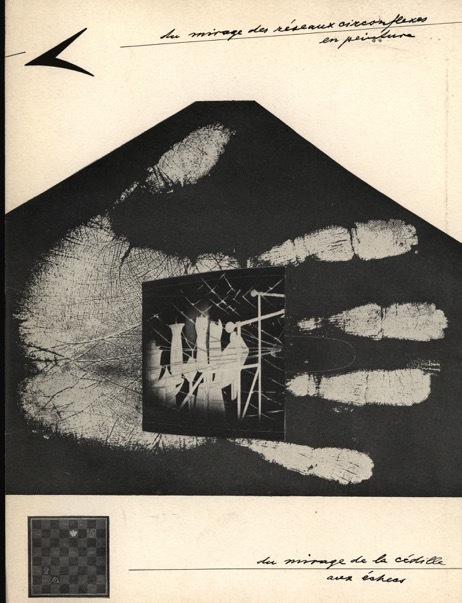 In comparison to similarly eclectic Parisian journals like Minotaure (1933–1939), VVV’s foregrounding of the second more embodied component of audience participation marks a major shift that occurred when surrealism crossed the Atlantic. Negotiating the tension between the expansiveness of the global war that had displaced them and their isolation from a disbanded European art community, the avant-gardists who managed to pull together VVV and other journals that circulated during World War II, such as View (1940–1947) and Dyn (1942–1944), were more aware of their precarious position than ever before. Reaching out through printed pages that could travel further than they could was thus a matter of survival that united the personal with the political and the logistical with the aesthetic. Let us first consider a specific example of VVV’s tactility. Paging to a spread midway through the VVV Almanac, a large sans serif typeface initially pronounces the title of Kiesler’s “Design-Correlation” with boldness and clarity (Fig. 1). Further reading reveals that the title in fact continues into the stream of a paragraph-length sentence that reaches the bottom of the page. The text diminishes in size, gains serifs, and splits abruptly to accommodate a group of three illustrations. And the placement of the word “break” at the beginning of the second section of Kiesler’s verbose definition of design-correlation serves as one indicator of the continuity that he stresses in architectural planning, here at play in the coordination of text and image (76). If readers miss this subtle typographic move, they need not worry. Additional text in a right-facing panel on that same page directs the gaze toward a full-page illustration on page 77, which will soon all but require the observer to become complicit in Kiesler’s demonstration of design-correlation. By rotating the VVV Almanac ninety degrees clockwise, the directions for “the correalist tool” become legible and satisfy the curiosity provoked by the yellow biomorphic cut-out floating on the opposite page. 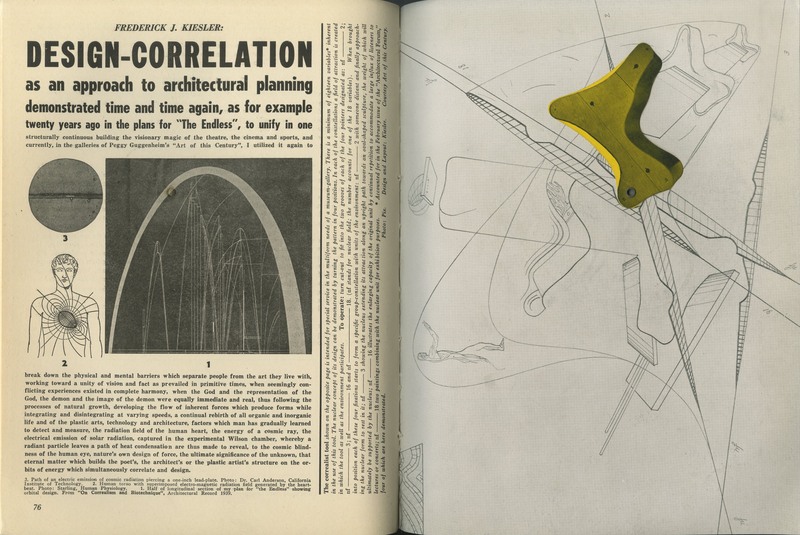 After a brief summary of ideas that he had earlier written about in Architectural Forum in 1943, Kiesler provides instructions on how “to operate” the correalist tool. This illustration was the first in VVV to be so minimally attached to the rest of the journal and reject a single fixed viewing point. He insists that turning the cut-out via the grommet with which one may maneuver it around the page so that it rests in one of four numbered positions will reorganize the page such that “a field of attractions is created in which the tool as well as the environment participates” (76). In other words, as participant-observers manipulate the goldenrod-tinted tool, its position affects perceptions of both figure and ground relative to the curving lines, grids, and other figures sketched in gray on the page. The simultaneous transformation of the movable biomorphic form and the expanse of the page, on Kiesler’s account, demonstrates the potency of design unity, which he contends has a particular application in “the multi-form needs of a museum-gallery” (76). Though Kiesler does not name a specific museum-gallery in his instructions for the correalist tool, he does do so in his preceding definition of “Design-Correlation.” Furthermore, a turn to the subsequent spread reveals more pointed visual references to Guggenheim’s Art of This Century gallery, which the designer had completed the previous year. In its upright vertical position, page 79 of the VVV Almanac displays a photograph from the Pix agency captioned “DETAIL OF GALLERY FOR ABSTRACT ART ‘ART OF THIS CENTURY’” (Fig. 2). The caption also identifies Kiesler as the Abstract Gallery’s designer (a convention that will continue in the labeling of two photographs of the Surrealist Gallery on the following page). 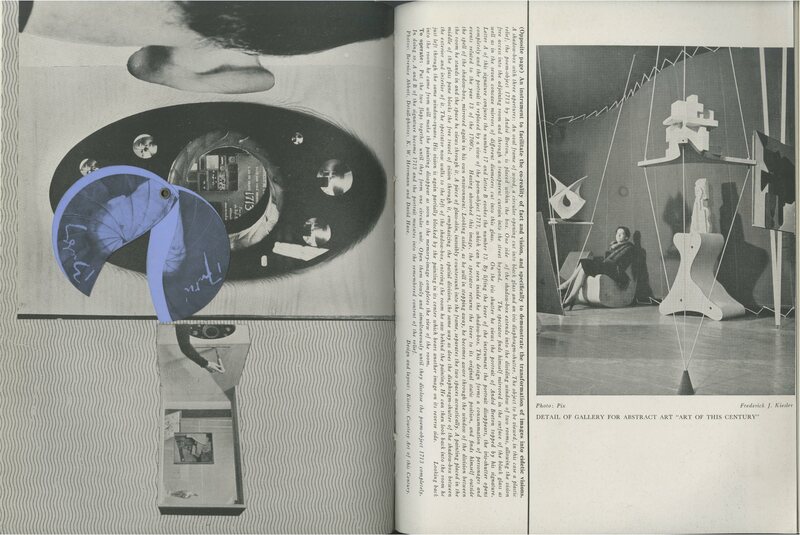 But the room in the photograph is also readily identifiable as Kiesler’s creation through the visual element near the center of the image: a more substantial version of the biomorphic cut-out from the previous spread. The yellow form is here rendered in grayscale, but its shape is almost immediately recognizable against the darker shade of the wall and its own cast shadow. In the installation of the gallery, the form serves as a plinth, its weightiness apparent in its ability to support another object and in its volume projected toward the wall in the photograph. In cooperation with a gallery-goer seated with legs crossed in a similarly configured biomorphic seat adjacent to the cut-out plinth, two sculptures suspended with lengths of string that reach from floor to ceiling. This arrangement conveys spatial depth through layering that complements the experience of manipulating the correalist tool. The observer can imagine the design elements of Kiesler’s Abstract Gallery shifting as she moves through Art of This Century, just as she saw the space of page 77 transformed through her maneuvering of the cut-out. The correlation between the biomorphic forms in the contexts of pages 77 and 79 also serves as the potential key to unlocking the relations between the otherwise inscrutable elements layered on page 78. The verso of the yellow cut-out’s grommet is a periwinkle-colored disk that further separates into two halves. When unified, the circle contains a photographic portrait of Breton accompanied by his signature and superimposed with the swirling lines of an iris shutter. When decoupled, the circle reveals an underlying image of an open aperture that surrounds a photo-reproduction of cropped white text on a medium-grey background, which also contains a grid of rectangles and squares. Like its recto, the entire arrangement extending outward from the inner circle is in grayscale, from a black oval punctuated by reflective circles to the portion of the back of a head with a closely-cropped haircut, its ear projecting downward sideways, to the image of a disembodied arm pulling the lever of a boxy contraption at the bottom of the page. Another counterclockwise rotation provides access to the text to the left of page 79, which one might expect to contain a set of instructions from Kiesler. But the reader does not learn how “to operate” the “instrument to facilitate the co-reality of fact and vision, and specifically to demonstrate the transformation of images into eidetic visions” until the conclusion of a lengthy paragraph that describes a device related to another aspect of Kiesler’s Art of This Century plans: the Kinetic Gallery (79).2 The portion of the page that is now to our left is actually a detail of the shadowbox illustrated at right. The backward head no longer appears as a sideways oddity but serves as a surrogate for VVV readers, though they cannot actually replicate the usage of the peephole that Kiesler describes in his instructions with the magazine materials they have been given. The operational guidelines instead provide a translation of the play between memory and image that the designer narrates in his description of the gallery installation. As Kiesler asks us to “slowly and simultaneously” separate the two halves of the periwinkle portrait of Breton to reveal the cropped reproduction of the poet’s Portrait of Actor A.B. in His Memorable Role, the Year of Our Lord 1713 in the inner circle, his instructions transform visual spectatorship into a more profound manual action than the interactions that took place in Guggenheim’s gallery. Because Breton’s “portrait mutates into the remembered content of the relief [Portrait of Actor A.B. ]” through mechanisms that are completely accessible to observers through their bodies and the tangible pages of the journal, those who engage with Breton’s poem-object in VVV are active memory makers rather than receivers (79). The multiple incarnations of Breton’s poem-objects attest to the significance of this concept in his definition of surrealism’s visual scope. Portrait of Actor A.B. is one of around a dozen poem-objects that the surrealist gatekeeper assembled, beginning in the mid-1930s. What’s more, Breton’s decision to draft “Du Poème-Objet” in February of 1942 suggests that his interest in arranging found objects and poetic text remained central to his ongoing theorization of surrealism at the time that he created Portrait of Actor A.B..3 The majority of the relatively brief essay in fact describes the poem-object’s visual components and outlines the work’s historical references to the extent that one suspects Breton wrote it within view of the assemblage mere months before Portrait of Actor A.B. became part of the initial installation of Guggenheim’s gallery. Kiesler’s account of his conception of the Art of this Century gallery in VVV is not only a matter of documentation or theorization like Breton’s essay but of transposition. The designer interweaves text and visual elements such that the observer is involved in an interaction with the material components of the journal—physically rearranging its pages before she realizes that she has transformed the object in her hand. This interweaving encourages moments of delight in rule bending that visitors to Guggenheim’s space also enjoyed. Nevertheless, as an object that can be carried anywhere and accessed at any time, VVV’s status as a printed publication allows the reach of its contents to extend beyond the rarified space of the gallery—far enough that the journal also exists as an autonomous creation. In short, Kiesler’s design-correlation in VVV also functions without prior knowledge of Art of this Century. This is not to say that the interactions we have with the correalist tool and eidetic vision instrument can occur without a decoding of conventions. It is ultimately VVVs consistent defiance of the magazine format, preventing our forward progress through its multidirectional pages with cross-references and unhinged motifs, which cements its status as artwork rather than reportage. 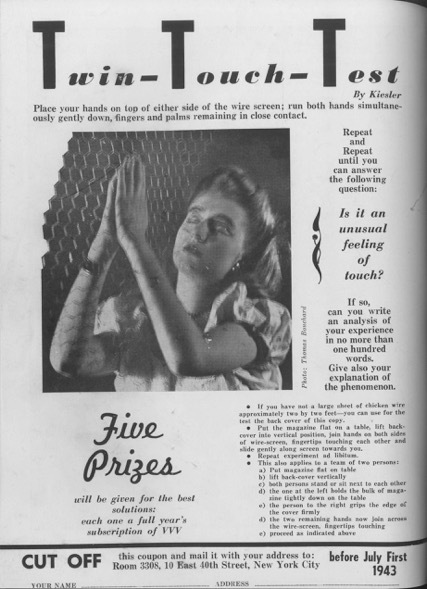 VVV was not the only short-lived form that served as an extra-architectural space for tactile surrealist displays during the war. Though her own family had emigrated from Ukraine when she was a child, Maya Deren self-determined her position at the margin of the circle of exiled European artists living in New York in the mid-1940s—a decision that has as much to do with her relative obscurity in art historical studies as her choice of medium. But her outsider status as filmmaker does not merit the isolation of her work from the painting and sculpture displayed as part of more canonical exhibitions like First Papers and in Guggenheim’s gallery. Like Kiesler’s graphic transpositions in VVV, Deren’s filmic version of the Art of This Century in Witch’s Cradle both does and does not exist as an autonomous work, independent of its referent. Taken together, the doubled meanings of Kiesler’s design-correlation and Deren’s film project confirm a more widespread strategy across surrealist media. Deren’s concentration upon the mobilized body not only in the Witch’s Cradle footage that she shot in 1943 but also throughout her corpus of films becomes apparent after even the most cursory consideration of her oeuvre. While scholars such as Mark Franko have thoroughly analyzed the filmmaker’s foregrounding of her own dancing form in films such as Ritual in Transfigured Time (1946) and testing of performance parameters in A Study in Choreography for the Camera (1945), much work remains to be done in examining the embodied perceptual experiences that Deren elicits from viewers. 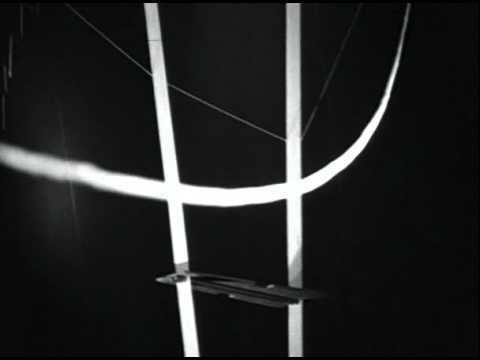 The delicate tightrope walk across time and space that Deren navigates so deftly in her most well-known film, Meshes of the Afternoon (1943), does not translate into the randomly spliced and digitized footage that stands as the only publicly accessible version of Witch’s Cradle available today (of which I’m aware, at least).4 Still, I argue that Deren’s unfinished film Witch’s Cradle is actually the ideal place to conduct an examination of the tangible dimensions of her cinematic world. As we struggle to determine the film’s intended sequence and to cohere the space of Guggenheim’s gallery reframed in disjointed fragments on screen, our enhanced participation in fact involves us in Deren’s grandest cultural ambitions for the medium of film. For Deren was ostensibly as interested in asking us to negotiate, to feel through her films as the exiled artists who created the immersive installations she filmed in the Art of This Century gallery. Deren’s Witch’s Cradle footage includes a series of panning shots that slowly move across the shadowy interior of Guggenheim’s gallery. The measured sweeping of the camera’s gaze might suggest an aspiration to provide a general view of the room—the type of establishing shot designed to summarize a setting in order to expedite the viewer’s mental leap into the diegetic space on screen. Yet Deren’s panning does not provide access to the generalized view we might expect. Relationships amongst objects displayed in the room and the alterations to the décor, walls, and pedestals suspended with lengths of white string, remain illegible. Instead, the camera’s sweeping movement, at times unexpectedly skewed, like a head tilting, focuses resolutely upon the material presence of the string—on its white contrast with the darkened space and on the patterns of its threading—so that the tension between the manmade webbing and the beholder’s expectation to navigate the gallery freely becomes palpable. Deren’s camera is a proxy for the fallible, sensing subject rather than a deliverer of an all-encompassing field of vision, a handheld tool that functions as much through the whims and limitations of its mobile user as through its objective optical mechanisms. In her recording of encounters between viewer and environment in which subject and object, interior and exterior, reality and representation all become inextricably muddled, we can observe Deren’s shared preoccupation with the spontaneous corporeal collisions that fascinated other surrealists. True, the filmmaker’s unedited outtakes confirm Sarah Keller’s identification of a “tension between careful planning and an invitation to openness” in Deren’s filmic incompletion (89). The footage neither matches the minimal description of six proposed sequences that Deren composed prior to shooting nor suggests a potential progression of events. No narrative or logical temporal solution emerges to cohere the jumbled shots. However, if we allow our attention to move through the actions of the two human performers who appear in the film, Anne Matta Clark and Duchamp, an unexpected material consistency emerges in Deren’s repeated returns to specific aspects of Guggenheim’s gallery (Keller 93–95). Duchamp’s multifaceted appearance in Witch’s Cradle surely confirms Deren’s interest in his work. She not only films the artist’s frustrated manipulation of the cat’s cradle threads but also his recreation of his 16 Miles of String installation from First Papers (Kachur 191). In a deviation from the seemingly impenetrable webbing that Duchamp installed at the First Papers exhibition, the hovering strings reinstalled in Guggenheim’s gallery during the Witch’s Cradle shoot the following year provide tenuous sensorial access to the space that we, in turn, experience kinesthetically through Deren’s filmic movement (Keller 93). Far from distinguishing her film from the curatorial mode that gave rise to 16 Miles of String, Deren’s extension of the mobility that Duchamp’s reinstallation allows actually confirms her involvement in Jolles’s tactile turn. Rather than emphasizing the productive potential in the indefinite spatial divide between viewer and viewed, Matta Clark’s fluid interactions with Deren’s guiding threads demonstrate that mediated-but-spontaneous gestures can themselves generate meaning. Considering this sustained interest in tactility as a strategy to reshape the space of the gallery in the years directly preceding Deren’s project, the ambiguity of Witch’s Cradle’s spatial structure gains a critical context. Indeed, the Art of This Century gallery does not just serve as the setting of Witch’s Cradle but also as Deren’s unfailing fixation. The panning shots that concentrate upon the intricate webbed strings also skim over wood-grain surfaces in a manner that encourages a kinesthetic desire as we long to enact the camera’s visual caress with our fingertips. We also follow Matta Clark’s fingers and toes as they guide her through the space—as if grasping for meaning. But as her curiosity appears to beckon her to examine the unfamiliar environment through deliberate physical engagement, other shots seem to deny such agency through sculptural blockage or camera tricks (some more successful than others) that animate strands of string so that they climb limbs and even form traps. So, while the crisscrossed arrangement of white string at times appears to allow for further manipulation of objects within the gallery, sequences in which Duchamp fumbles with a cat’s cradle confuse the relationship between object and user as his hands become tangled in its web. Certainly, Deren’s initially perplexing inclusion of a shot framing a beating heart, secured in an open chest cavity, becomes more discernible when we realize the filmmaker’s attempt to align multiple interiors—mental and physical, organic and constructed—within Guggenheim’s gallery.5 Equally palpable as Keller’s idea of the tension of incompletion is the tension between the materiality and agency of the body in relation to the spatial configuration of the interior and the inanimate objects contained therein, a dynamic that Deren transposes directly from tactile surrealist installation strategy. While Deren’s inability to form a codified spatial system in Witch’s Cradle relates to her inexperience as a filmmaker as she embarked upon the project, her sustained interest in working out and rearticulating filmic space through embodied movement suggests that her decision to take on the Art of This Century as an early subject merits more serious attention. For many (if not all) of the makers of the objects in the exhibition on display in Deren’s footage shared the filmmaker’s desire to reconfigure the space of the gallery through innovative engagements of the modern mobile body. Nevertheless, it is necessary to account for the filmmaker’s avowed distance from the surrealist movement as well as her criticism of surrealist practice in her theoretical writings, a stance that she shared with prominent European defectors during the war. Deren’s adamant condemnation of the (frequently fluctuating, seemingly self-destructive) group as she simultaneously appropriated their curatorial strategies and tangible objects into her practice—most obviously in Witch’s Cradle but also more subtly in the embodied perception that her later films encourage—does not, in fact, suggest the hypocrisy that we may first envision. Simply put, the radical manipulations of tactile surrealism were not as apparent in the 1940s as they have become through contemporary scholarship. In a specific example of a deficiency that can be applied to the overall curatorial practice, Jolles for one describes the “failure” of the Parisian Exposition Internationale du Surréalisme “to distinguish itself sufficiently from the very forms it hoped to critique: either the commercial venues its sought to desublimate (the department stores) or the historical installations whose false ideology it aimed to expose (the wax museums)” (207). The gallery interior remained a sanctified space in spite of surrealist efforts to the contrary. Might Deren’s transposition of Art of This Century into the mass medium of film then serve as a perfect solution, the ideal escape plan from the confines of the gallery? Despite Deren’s unconscious transgressions of pointed statements she would make in her 1946 treatise An Anagram of Ideas on Art, Form and Film, the unedited Witch’s Cradle does curiously manage to participate in the wider world of forms in which she hoped her completed works would also traffic. The viewer’s experience of Witch’s Cradle as footage filmed by an individual filmmaker provides a more overt but ultimately less potent version of the interactions that VVV encourages. Deren’s projected cinema serves as a point of departure for the participant observer tasked with decoding the movable components of the journal. Rather than flummoxing the reader with its feedback loop of non-linear elements, VVV transforms the reader into someone else altogether—or, more, accurately enlists the reader in two different roles. The observer participates, on one hand, as Deren, the filmmaker who coordinates and organizes the collection of voices that appear in the journal. Each page is a frame to be edited and joined in montage. On the other hand, the observer is the bewitched gallery-goer, Matta Clark, whose embodied gestures guide her through an unfamiliar space. Place your hands on top of either side of the wire screen; run both hands simultaneously gently down, fingers and palms remaining in close contact. Is it an unusual feeling of touch? If so, can you write an analysis of your experience in no more than one hundred words. Give also your explanation of the phenomenon. These are instructions for a game with serious implications that become more available the more embedded one becomes in the webbing of surrealist creation. Still, the strands that link VVV’s interactivity to Witch’s Cradle are not merely important because they connect print and cinema to Duchamp’s 16 Miles of String in the space of a surrealist exhibition or to the longer-standing practice of surrealist parlor games like the Exquisite Corpse. Both the journal and the film are also distinctly accessible to those outside of the intimate, once closely guarded circle of surrealists. They depend as much upon the participant’s familiarity with mass media as with the intricacies of Bretonian automatism. VVV’s status as handheld cinema is what finally allows the journal to fulfill the radical revelation that its introductory manifesto proclaims. The promise on each issue’s first page to make visible “the myth in process of formation beneath the VEIL of happenings” requires a level of permeability that journal collaborators would have resisted if not for their wartime vulnerability. As the surrealists’ forced displacements so violently repeated creative experiments in dépaysement, wrenching “all the reactions of the eternal upon the actual, of the psychic upon the physical” into an incomprehensible new reality, the pages of VVV convey the desperate longing for contact that had come to sustain the movement as never before (VVV, no. 1-4 1). By way of conclusion, I would like to consider VVV’s precarious tactility in relation to a broader history of surrealist homelessness in the 1940s. It cannot be denied that the journal was too sporadic and short-lived to sustain organized surrealism into the postwar years—that VVV’s version of handheld cinema acted as a catalyst to the movement’s dispersion in exile. But I hope to assuage any lingering doubts that, though esoteric and enigmatic, VVV responded to a widespread aesthetic and political emergency that still resonates today. The threat of homelessness that was a life-altering and potentially life-ending concern for many Europeans in the early 1940s directly resulted in the avant-garde’s migration across the Atlantic. Nevertheless, as unfamiliar with their new surroundings as they may have been, refugee artists in the surrealist milieu were no strangers to the idea of homelessness in the aesthetic sphere. Rosalind Krauss’s identification of “a kind of sitelessness, or homelessness, an absolute loss of place” as the determining condition of “Sculpture in the Expanded Field” confirms a scholarly acceptance of artist-initiated displacement as a modernist aesthetic strategy (280). VVV represents a reaction to the collision of these two types of homelessness, one controlling and one controllable, in the biographies of the journal’s makers. Yet, VVV’s tactile pages do not reflect a willingness to adapt to interminable displacement like Duchamp’s contemporaneous Boîte-en-Valise. Though the almanac issue of VVV does include an advertisement for the suitcase of miniature reproductions of the artist’s oeuvre (available for purchase through Art of This Century), the editorial board used their journal’s portability to support a strategy in direct opposition to the retrospective function of Duchamp’s Boîte. Rather than repackaging readymade works in the service of their preservation, VVV records a nascent effort to reground surrealist practice in a new social context that was still largely unknown to its makers. Their forward-thinking mission required the relaxation of the tight grasp that surrealists had enjoyed in their familiar Parisian surroundings and the surrender of the movement into the hands of dexterous readers. So, while VVV continued the “profane illumination” that Walter Benjamin had identified as fundamental to the revolutionary capabilities of surrealism prior to the war (“Surrealism” 49), the destabilization of the everyday lives of the journal’s creators and consumers brought tactility to the fore to sustain the last bastion of surrealism on the brink of its dissolution. In short, what distinguished VVV from all previous surrealist publications was an utter lack of the habitual in the early 1940s. In the midst of a worldwide conflict, none of the daily routines of modern existence were safe from interruption by destructive forces—real or imagined. The sly disruptions in quotidian rhythms that Benjamin tied to surrealism’s ability to affect change could not occur in the midst of such uncertainty. Nor could the VVV group expect their subscribers to hone their haptic faculties by repeated practice. Benjamin had described the use-value of the tactile in the interwar period in his well-known “Work of Art” essay, wherein the critic identified tactile perception as a model upon which to build the extra-optical knowledge necessary to thrive in modernity (238–40). But in the absence of any apparent internal logic, the journal possesses the same random tangibility as a grab bag. Repeated encounters always surprise in a manner that destabilizes past meanings so that recurring contact confuses rather than familiarizes. If the incorporation of the American vernacular—from Alaskan masks to pulp fiction—amongst lines of European poetry was an attempt on the VVV editorial board’s part to reproduce Minotaure’s ethnographic surrealism, such a willful arrangement of eclectic materials was no longer credible.6 Unlike the interwar Parisian publication, the wartime journal had no stable frame of reference, no disciplinary parameters to guide the selection of contents or graphic layouts. New York galleries like Art of This Century were struggling into existence alongside an equally unfocused and heterogeneous art community. To distinguish the particulars of surrealist practice from other forms of art making was all but impossible in a moment when no creative pursuit had a certain future. To be sure, VVV’s continued allegiance to surrealism set the journal apart from its immediate contemporary, Dyn, which the exiled Wolfgang Paalen published out of Mexico City. Paalen renounced the restrictions of Bretonian surrealism in Dyn, jettisoning the ineffability that arose from the misalignment between VVV’s supposedly orthodox adherence to the movement and the inconsistency of the journal’s contents. For example, Paalen was able to print extensive reports on his travels to study indigenous visual culture in British Columbia as part of Dyn’s "Amer-Indian Number" (double issue no. 4–5) without the burden of conjuring a new mythology for surrealism in the Americas out of thin air. Deren, too, went on to distance herself from avant-garde circles by pursuing an ethnographic interest in Haitian vodou in the late 1940s. And though she did not assemble the hours of footage she filmed into a complete film by the time of her death, she did write a book on the subject, called Divine Horsemen: The Living Gods of Haiti. Deren’s research in Haiti also coincided with her transition from a filmmaker who coordinated metaphoric gestures and artfully framed handiwork on screen to a community organizer who supported experimental cinema through the Creative Film Foundation. In addition to multiple essays that illustrate the high points of the artist’s career, personal reminiscences, and reprinted texts from dadaist revues, the Duchamp number of View includes an interactive feature designed by Kiesler (Fig. 4). As in his contributions to the VVV Almanac, Kiesler’s instructions for “Les Larves D’Imagie D’Henri Robert Marcel Duchamp” (24–30) appear in a panel on the page facing the interactive components of what that designer describes as a “Triptych,” but there is no need to rotate the page to read them. The text is likewise more straightforward, uninterrupted by the more obtuse interludes that accompany the directions printed in VVV. Though Kiesler does note that there might be more to find “between the lines” than he lists amongst the contents of the space he depicts, he states plainly in the first sentence that the unfolded triptych “represents three walls of Duchamp’s studio on 14th street in New York.” The bulk of the remaining text then describes what the reader can expect to find upon folding the pages: photographs that Kiesler has photomontaged to approximate the artist’s workspace or cut-out sections that merge to create additional facsimiles. Unlike the correalist tool and the translation of a Bretonian poem-object that present each participant-observer with more fluid tactility in VVV, the “Poeme Espace dédié à H(ieronymus) Duchamp” in View represents a finite directive. To build the replica is to have access to a distinct studio space replete with a mound of crumpled paper, populated with photomechanical versions of Duchamp’s standard stoppages and his Large Glass, and centered with a portrait of the artist himself, in profile from behind his desk. Kiesler’s attempt at interactive encapsulation for View thus has more in common with Duchamp’s compartmentalization of his homelessness in Boîte than with the handheld cinema the designer had created for VVV. Despite differences in Kiesler’s contributions to VVV and View, there are reoccurrences in motifs and language that invite speculation into what the surrealist-adherent journal might have become had it lived to see the victory its title so enthusiastically prophesied. On the recto of one of the photomontaged triptych panels representing Duchamp’s studio, the fine lines of what one surmises is a print in white of the artist’s hand outstretched across the horizontal axis of a black ground (Fig. 5). A rectangular cut-out detail from the Large Glass masks the upper palm, and the geometric grid of a chessboard also appears on the page along with two handwritten lines of French in circumflex forms. The hand opens, perhaps poised and prepared to act, between “du mirage des réseaux circonflexes en peinture [from the mirage of circumflex networks in painting]” and “du mirage de la cédille aux échecs [from the mirage of the cedille to chess].” As with Breton’s evocation of the mirage in VVV’s first issue, the outstretched hand appears in a moment of possibility, before we have fit together the pieces of Kiesler’s design to form a distinct Duchampian space. No matter that this paper studio is a flimsy replica, lacking in functionality. Kiesler’s design even manages to right the upended installation shot of 16 Miles of String from First Papers that had appeared in VVV (no. 2–3 86). And with such infusions of pragmatism, View reabsorbs some of the unwieldy bulk of the everyday in a way that VVV never could due to ideological vigilance. In the end, VVV’s fluid tactility reflects a limited historical moment that encouraged a specific strand of magical thinking in the minds of its creators. The preservation of surrealism itself, writ large, served as the mirage that gave purpose to those who continued to fight for the displaced movement. But as the tactile became tactical, surrealism slipped away from its most loyal guardians to be subsumed into the optical unconscious with cinema as its companion. VVV’s synchronicity with Deren’s experimental film then marks a moment when handheld cinema became fully contingent upon the connection between gesture and imagination—a moment when no medium could guide another. 1 Neither Ernst’s nor Duchamp’s work is captioned. In a 2003 article, David Hopkins discusses Allégorie de Genre in conjunction with the First Papers of Surrealism Exhibition and its catalogue. Duchamp initially assembled the silhouette with iodine-stained gauze as a contribution to the March 1943 “Americana” issue of Vogue, but the image was later deemed unacceptable for the magazine’s cover. 2 In addition to naming Kiesler’s responsibility for “Design and layout” and stating that the whole arrangement is “Courtesy Art of this Century,” the text also attributes “Photos” to Bernice Abbott and “Detail-Photos” to K.W. Herrmann and David Hare. The distinction between the latter two image categories remains ambiguous. 3 Though not immediately published, Breton’s text was eventually included Le Surréalisme et la Peinture. A digitization of his handwritten manuscript can be found here (last accessed 14 December 2018). 4 This analysis references the YouTube compilation provided here, “Witch's cradle (Maya Deren, M. Duchamp - 1943)." Interestingly, according to Lucy Fischer, a flux of re-apparitions of Deren’s films, facilitated by digital editing technologies and worldwide streaming services, have become as integral to the filmmaker’s presence in contemporary culture as scholarship. 5 The warm modulating light, intermittent rumbling of train sound effects, and concave walls of the Art of this Century’s Surrealist Gallery have also provoked further comparison to the body’s interior, especially the womb. 7 The publication is subtitled “The Modern Magazine” by this time, and a famous quotation from Arthur Rimbaud’s Une Saison en Enfer (1873), “Il faut être absolument moderne,” appears on contents page of the Duchamp number, hinting at Ford and Tyler’s poetic proclivities. Stills from Maya Deren’s Witch’s Cradle featuring Duchamp are also a part of the special issue. The accompanying caption reads as if from Deren’s shooting script, and the vertical sequence looks like a filmstrip without perforations, showing single string constrict around Duchamp’s neck like a noose. Benjamin, Walter. “The Work of Art in the Age of Mechanical Reproduction.” Illuminations: Essays and Reflections, translated by Harry Zohn, edited by Hannah Arendt, Schocken, 2007, pp. 217–52. ---. “Surrealism: The Last Snapshot of the European Intelligentsia.” Reflections: Essays, Aphorisms, Autobiographical Writings, translated by Edmund Jephcott, edited by Peter Demetz Schocken, 1986, pp.177–192. Breton, André, Le Surréalisme et la Peinture. Revised ed, Gallimard, 1965. Demos, T.J. “Duchamp’s Boîte: Between Institutional Acculturation and Geopolitical Displacement.” Grey Room, no. 8, Summer 2002, pp. 6–37. Deren, Maya. “An Anagram of Ideas on Art, Form and Film.” Essential Deren: Collected Writings on Film, edited by Bruce R. McPherson, Documentext, 2005, pp. 35–109. ---. Divine Horsemen: The Living Gods of Haiti. Thames and Hudson, 1953. Dimakopoulou, Stamatina. “Europe in America: Remapping Broken Cultural Lines: View (1940–7) and VVV (1942–4).” The Oxford Critical and Cultural History of Modernist Magazines, vol. II North America 1894-1960, edited by Peter Brooker and Andrew Thacker, Oxford UP, 2012, pp. 737–58. Fischer, Lucy. "Afterlife and Afterimage: Maya Deren in 'Transfigured Time'." Camera Obscura, vol. 28, no. 3, 2013, pp. 1–31. Ford, Charles Henry and Parker Tyler, editors. The Marcel Duchamp Number, special issue of View, vol. 5, no. 1, March 1945. Franko, Mark. “Aesthetic Agencies in Flux: Talley Beatty, Maya Deren, and the Modern Dance Tradition in ‘Study in Choreography for the Camera.’” Maya Deren and the American Avant-Garde, U of California P, 2001, pp. 131–49. Hare, David, editor. VVV, no. 1–no.4, June 1942–February 1944. Hopkins, David. "The Politics of Equivocation: Sherrie Levine, Duchamp's 'Compensation Portrait', and Surrealism in the USA, 1942–45." Oxford Art Journal, vol. 26, no. 1, 2003, pp. 45–68. Jolles, Adam. The Curatorial Avant-Garde: Surrealism and Exhibition Practice in France, 1925–1941, Penn State UP, 2013. Kachur, Lewis. Displaying the Marvelous: Marcel Duchamp, Salvador Dalí, and Surrealist Exhibition Installations. MIT Press, 2001. Keller, Sarah. “Frustrated Climaxes: On Maya Deren’s Meshes of the Afternoon and Witch’s Cradle.” Cinema Journal, vol. 52, no. 3, Spring 2013, pp. 75–98. 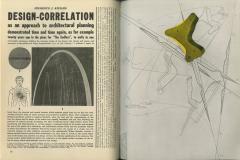 Kiesler, Frederick J. “New Display Techniques for Art of This Century.” Architectural Forum vol. 78, no. 2, February 1943, pp. 49–50. Krauss, Rosalind. “Sculpture in the Expanded Field.” The Originality of the Avant-Garde and Other Modernist Myths, MIT Press, 1984, pp. 276–90. Leddy, Annette and Donna Conwell. Farewell to Surrealism: the Dyn Circle in Mexico, exh. cat. Getty Research Institute, 2012. Mileaf, Janine. Please Touch: Dada & Surrealist Objects After the Readymade. UP of New England, 2010. Paalen, Wolfgang, editor. Amer-Indian Number, special issue of Dyn, no. 4–5, December 1943. Tashjian, Dickran. A Boatload of Madmen: Surrealism and the American Avant-Garde. Thames & Hudson, 2001.